iPhone app developer Ben Kazez has already taken on the friendly skies with his FlightTrack and FlightTrack Pro flight status updaters. His latest app wants to ensure that you’ve got a place to stay once you’ve arrived at your destination. HotelPal uses the iPhone's location features and built-in maps to show you where nearby hotel rooms are that you can book. Kazez, founder of app maker Mobiata, had a new program make its App Store debut this week—HotelPal. The app uses information from Travelocity to search for rooms among 100,000 hotels around the world. When you do a search, HotelPal provides real-time results, listing only hotels with available rooms. Once you’ve found a room, you can book it directly from the app. “Our goal is to make it easier to book hotels on your iPhone than it is on your computer,” Kazez said. That’s a pretty tall order. After all, while the iPhone has many things going for it as a platform, but data entry using the on-screen keyboard isn’t necessarily one of them. Still, Kazez thinks HotelPal takes advantage of several key iPhone features to create a better hotel finder. 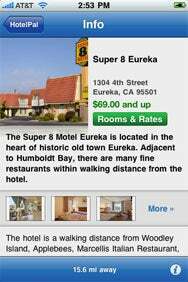 The app taps into the phone’s ability to pinpoint your location, allowing you to search for hotels that are close by. (You can also search by price.) Maps are built directly into the app so you can see precisely where a hotel is, relative to your current location. Kazez says that makes HotelPal ideal for finding a place to stay at the last moment, say if you’re on a road trip or your flight has just been canceled. The app also uses the iPhone OS’s AutoFill features to fill in hotel booking info. Booking a hotel room through HotelPal is done with 256-bit SSL encryption, addressing any security concerns. One of the first things you’ll see when you tap on a hotel listing is pictures of the property. Instead, Mobiata is betting that people are more interested in seeing where they might be staying. So when you tap on a hotel listing in HotelPal, one of the first things you’ll see is a series of tappable photos of the hotel room. “We give center stage to the photography,” Kazez says. “We try to make things as visual as possible.” Scroll down a little further on the detail page for a description of the hotel and a list of its amenities. HotelPal, which works on any iPhone or iPod touch running the iPhone 3.0 software update, is a free download at the App Store. Kazez says a pro version is in the works, though no release date is planned as of yet. An earlier version of this story listed the wrong iPhone OS version based on HotelPal’s App Store listing. That information has been corrected.